For years, there has been talk of the wonders of the Internet of Things (IoT). Enabling machines to send and receive data has long been touted as the next big thing, but although it has held a lot of promise, IoT never really seemed to get out of the starting blocks. This seems to be changing. As devices are becoming ‘smarter’ and cheaper, networks are being configured to handle large quantities of data. Brian Sangudi, principal strategy consultant, Ericsson Middle East & Africa: The ecosystem still has to evolve, but having said that, I definitely think the moment has arrived. Those who want to take advantage can already do so. The building blocks, the infrastructure, is already there. Alain du Toit, Intelligent Cloud Business Group lead, Microsoft SA: One of the underlying challenges the IoT still has to face is uptake of IPv6 from an enterprise perspective. We are running out of IP addresses. As millions of devices come online, they are going to gobble up an already depleted IPv4 addressing scheme, and if enterprises don’t deal with this, they are going to run out of IP addresses in terms of building this ecosystem. Vishal Barapatre, CTO, In2IT Technologies: The statistics don’t lie. We are sitting with 22 billion devices now, and by 2025, it will be three times this number. There’s not only more connectivity, but the falling prices of sensors are also playing a role. Dr Mark Nasila, head of advanced analytics for consumer and retail, FNB: From what I’ve seen, the IoT is already ‘the business’ for a lot of organisations. This is especially true in the financial sector, where many firms have already invested a lot in their data strategies. As they now understand their customers a lot better, they are also better at being proactive in providing them with services and goods. This has seen a lot of organisations move from providing a single service, to being a multi-service provider. Steve Mallaby, COO, Argility Technology Group: It has undoubtedly arrived. It’s been around for many years, the concept of devices being connected to each other. If you look at the rapid growth that’s taken place, you are even starting to see fragmentation across the industry. The key development will be how the mature players in the sector start working together. But this is something that’s still a work in progress. Warren Green, governance, risk and compliance expert, CURA Software Solutions: I think the moment has arrived. But I do think the ecosystem will continue to develop. For me, this will be from a governance, risk and compliance perspective. Phathizwe Malinga, CEO, SqwidNet: We view the IoT ecosystem as a symphony in four parts. Locally, we have about ten device makers, there are also two connectivity providers, as well as several application providers. The last part is industry, which is starting to realise that IoT is not a fringe thing or a complementary thing; it’s a core part of their operations. Industry needs to make its assets sweat, but in order to do so, it needs to know where they are, which is what IoT allows it to do. Deon Oosthuysen, senior product manager: IoT, Vox: No one understands the buzzword, IoT. We have to put it in terms they understand. This means not even putting it in terms like ‘machine-to-machine’, but, rather, frame it on issues like ‘agri security’. IoT is still a buzzword among technologists, but the people in the trenches don’t know what it means. Greg Montjoie, COO, Comsol: I agree with Deon. The question depends on what vertical you are addressing. We find there’s a big disjoint between the ICT sector and the ‘sensor guys’ – the electricians and the plumbers – who will be inserting IoT sensors. Some of the industry verticals are really efficient at getting things done, but there are also guys who don’t know how to go about it. The key point is where there are skills, we are going to see a fast uptake of IoT adoption. And for those clients who don’t know how to get sensors in the field, we will have to walk that journey with them. Phathizwe Malinga, SqwidNetAlain du Toit, Microsoft SA: Just to carry on from what Greg is saying, some industries are just geared to take up IoT faster than others. If you look at the manufacturing sector, it’s almost a natural progression for those kinds of businesses, to empower themselves with IoT, as they grow into the future. The health sector comes a good second, but for retailers, IoT is a niche application. Some industries will still need some education. Rodney Taylor, CEO, Activate Group: I represent two companies, one is a platform and the other is a systems integrator. We are sort of getting everyone to come to us. Networks are coming to us to integrate into our platform, systems integrators want to talk to us about application builds and we have people creating devices, wanting to connect these devices and the sensors to platforms so they can create ‘big data’. The demand is strong. When we had an IoT event, over the two days we had it, 198 people attended, varying from a guy building stuff in his garage to CIOs. From an adoption perspective, it has been insane. We can’t keep up at the moment. Brian Sangudi, Ericsson Middle East & Africa: I just want to add that when it comes to education, it should be about what value IoT gives to the customer. Greg Montjoie, ComsolPeople have a hard time figuring out what kind of value IoT will create for their business. It could be cost savings or some additional revenue. The other side is the risk. If these devices break, who maintains them? So there has to be some education around the value and the risk. Roger Hislop, senior research engineer, Internet Solutions (IS): What needs to be remembered is that there are two distinct types of customers. There are the operational people, who have seen IoT types of technology for 30 to 40 years. And then there are the IT people, and this is all new to them. The goal of IoT is to provide information to the operational people, but this means getting it from the IT people, who are not used to their technical requirements. This is where a lot of education to the end-users has to come in, in that the operations guys need to understand the IT guys’ issues, and they, in turn, need to understand the operations guys. Greg Vercellotti, Dariel: There is a small element of IoT being a big hammer looking for a nail. But on the fl ip side of that, as businesses digitise, they are looking for the opportunity to automate, which creates an opportunity for IoT to underpin that. Phathizwe Malinga, SqwidNet: I want to agree with Greg here. If we look at the word ‘demand’ in terms of your question, why all of sudden is there demand? It comes down to competitive advantage. Competitive advantage is something you can no longer go to a business school to get. The only way you can now get it is by understanding your context better – what are your assets doing, how are your customers behaving? This is where IoT comes into its own. It’s such an enabler for this. The harder it is to find a competitive advantage, the higher the demand. Roger Hislop, Internet Solutions (IS)Dr Mark Nasila, FNB: Another driver will be the cultural shift in business. Organisations are realising that for them to get a competitive advantage, they will have to collaborate with other service providers. This is because no organisation will have the resources to meet the demands of their use cases like real-time offerings. At the same time, customers are loyal to the organisations that provide most of what they need in life, and we are seeing a lot of collaborations between organisations, systems and technologies, which are in line with use cases that will meet customer needs. 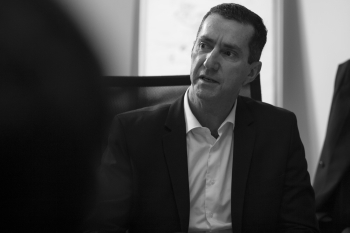 Greg Palmer, sales director, Sage Enterprise, Africa division: One of the things we have not spoken about regarding increased demand, is the new asset class we all have to deal with – data. Vishal Barapatre, In2IT Technologies: If you look at IoT, many industries were using it before the term was coined. What has changed is that people are getting more out of it in terms of stuff like analytics. It’s one of the reason demand for IoT is on the rise. Even so, in my view, adoption of IoT is still hazy. This is where business education can still play an important role in growing it as it can bridge the gap between IT and IoT. They use two different processes and come from different mindsets. They need to work together so IoT adoption can happen in a disciplined way. Nico Steyn, IoT.nxtNico Steyn, CEO, IoT.nxt: For me, it really comes down to business value. A lot of discussions with CIOs come down to strategy. So rather than going down a line of selling them on the wonderful tech that’s available to us, the tech is actually secondary. What it comes down to is what business leaders want to do things differently in the business, and technology enables that. David Slotow, CEO, Trackmatic: In my view, IoT has arrived and in my industry – supply chain and logistics – it arrived a few years ago. Although there have been sensors in vehicles for a while, the disconnect between IT and logistics means IoT has not lived up to its potential. For instance, even with all of this technology available, you still can’t tell what time the delivery will happen. We are seeing a lot of people building solutions, but we are not seeing a tangible effect on operations. Nico Steyn, IoT.nxt: You’re right. This is where the true unlocking of this technology actually happens. It has to be end- to-end. It has to be in the entire ecosystem. Take a cool drinks maker. This business comprises fridges, trucks and bottling plants, but what it really is, it’s about a whole lot of fridges holding stock. The whole goal of the business is to keep drinks cool.